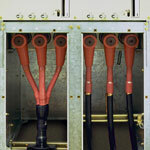 The thermoseated end sleeve of POLT 12D/1XI L12A of indoor unit for shielded single-conductor cables with plastassovy isolation. The set includes tips and materials for three phases. 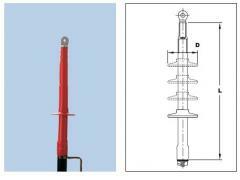 The design of the POLT 12D/1XI L12A coupling of the Wire of the screen of a cable or the grounding conductor are pressurized by sticky mastic. The yellow tape for distribution of electric field strength is reeled up in the field of a cut of the semiconducting screen of a cable. 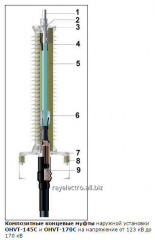 On an inner surface of the trekingostoyky insulating tube the layer of the pressurizing mastic with properties of alignment of electric field strength is put. 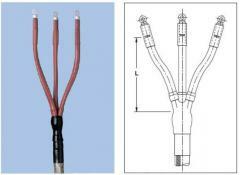 It isolates and pressurizes a vein between the termination of an outside cover of a cable and a cable terminal. 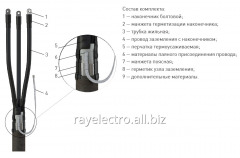 Unbelievable price on The end sleeves thermoseated, POLT 12D/1XI-L12A, end sleeves the thermoseated, connection sleeves, Electrical equipmen in Almaty (Kazakhstan) company RayElectro-KZ (RajElektro-KZ), TOO.